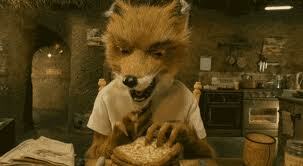 Has anyone seen Fantastic Mr. Fox? Well, I feel a lot like him when he eats his french toast. For some reason YouTube had the embedding disabled, so I couldn't bring it straight over, but I did get the link for the trailer with the scene in it. Check-out his eating habits. He is so sophisticated, yet.... hmmm. That is definitely how I feel I eat. For as much as I preach about assessments and reassessments, I figured I had better get to it myself. So I decided that it was time to check out how well I have been doing on my goals. At the beginning of the year I had decided that since I had worked hard enough to get the weight off, that it was high time I started teaching myself to eat mindfully. If we are being skillful about P.L.E.A.S.E. ; then it would stand to reason that at some point I would indeed need to know how to eat mindfully. OK, so how well as that been coming along? I mean it is March now, I have had two solid months to work on it. I have been ravenous. Ergo - my connection to Mr. Fox. No, I do not think I am a man! Nor do I believe myself to be "foxy" as the title would convey. Rather I feel like when I eat, I scarf it down like he does. It is ridiculous. When I am finished I am so full it hurts, so in turn I starve myself through the next few meals until I cannot contain my hunger again. We know this is completely opposite to what is suggested for healthy eating; and I seriously doubt that Marsha was referring to this sort of behavior when she described "opposite action" ~ Alright, so it would be safe to assume that I have failed thus far on my goal. I have not even made baby-steps. If I am going to do as I encourage others to do, then I am going to go for a walk today and clear my mind of all the judgments that have surfaced over this particular failure. Refocus, grab my balloon and sail high, back-up to the start and fail-well. I am not going to just start over and hope that I get better results. So what I am also going to do is to set up different perimeters to increase the likelihood of success. For this goal I plan on getting an eating journal. I will commit to writing a brief sentence of what I expect each eating experience to be before I eat my meals. When I am finished with my meal, I then commit to writing how my actual experience was compared to what I expected it to be. I will only make this one change towards my goal. I will reassess in one month's time and check how things are going. I will keep everyone posted on my progress with this goal. If anyone has a goal they are trying to reach and would like to share how it is going for them, we all would love to hear about it! Are you finding success, if so, what methods are you using?